​Legendary guitar virtuoso, multi Grammy Award winner and a Rock and Roll Hall of Famer, Carlos Santana, and his band Santana, will take in five huge dates across the country on his Transmogrify Tour. The tour will kick off at Perth Arena on Friday 7th April before heading to Adelaide, Melbourne, and Canberra, as well as performing at Byron Bay’s Bluesfast. The mighty Doobie Brothers will join Santana as special guests on the Perth, Adelaide, Melbourne and Sydney dates, adding to both artists’ already announced appearances on the mammoth bill for the 28th Annual Bluesfest in Byron Bay. A global enduring favourite of the 1970’s, The Doobie Brothers combine a touch of blues, and plenty of soul and rock ‘n roll to create their nostalgic Californian rock sound. Their celebrated back catalogue of music includes hits like Listen to The Music, Long Train Runnin, What A Fool Believes and so many more. Rounding out a vibrant three-act bill for a special one-off performance at Adelaide’s Botanic Park on Sun 9th April is local icon Russell Morris. Known for his global 1969 hit The Real Thing, Russell has in recent years received widespread acclaim for his Australiana blues trilogy of albums. From Woodstock to the Hollywood Bowl and everywhere in between, Carlos Santana is one of the most prolific and influential guitarists of all time. In a career spanning more than forty years, Santana has sold in excess of 100 million records and reached more than 100 million fans at concerts across the globe, with no less than ten Grammy Awards and three Latin Grammy Awards to his name. 1999’s Supernatural album saw Santana chalk up a record-tying nine Grammy’s for a single project, including awards for Album of the Year and Record of the Year for Smooth. Among many other honours, Rolling Stone has cited Carlos Santana as #15 on their list of the "100 Greatest Guitarists of All Time”. The Doobie Brothers legacy has been built not just on hit records, but also on an unrivalled commitment to musical integrity and a steadfast allegiance to their enthusiastic fan base. The band’s ability to evolve in a constantly changing industry and connections to generations of listening audiences is a testament to their craft. With founding members Tom Johnston and Pat Simmons, and 30 year-plus veteran John McFee, The Doobies will be performing as a seven-piece band including Bill Payne, Ed Toth, John Cowan and Marc Russo. The Doobie Brothers were inducted into the Vocal Group Hall of Fame in 2004, have won four Grammy Awards and sold more than 48 million records worldwide (including three multi-platinum, seven platinum and fourteen gold albums). Their 1976 Best of the Doobies has sold more than 12 million copies, earning rare RIAA Diamond status. Their No.1 gold certified singles Black Water (1974) and What A Fool Believes (1979) lead a catalogue of hits that includes Listen To The Music, Jesus Is Just All Right, Rockin’ Down The Highway, Long Train Runnin, China Grove, Take Me In Your Arms, Takin’ It To The Streets, Minute By Minute, You Belong To Me and The Doctor. In all, The Doobies have tallied five Top 10 singles and sixteen Top 40 hits. 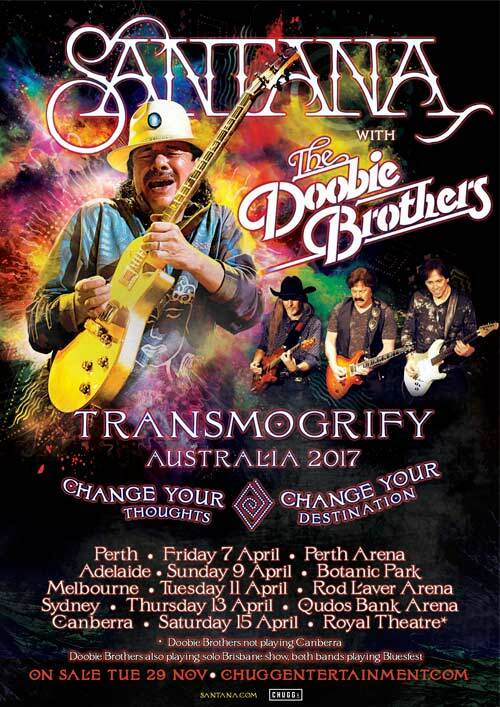 Santana will touch down in Australia with Special Guests The Doobie Brothers straight off the back of a multi-year residency at the famous House of Blues in Las Vegas. He will be set to ignite stages across the country once again, with a style that fuses Latin rock, blues, soul and jazz, transcending time and the limits of genre typecasting. Santana plays a standalone show at Canberra’s Royal Theatre, Sat 15th April. Dynamic young indie artist, Tash Sultana, will join Santana at this intimate show. Tash has been making waves across Australia this year, generating massive street buzz and creating a legion of fans with her carefully crafted, edgy fusion of multi-instrumental pieces that see the songstress shift from singing to beat boxing, combined with her unique percussion styled finger-tapping guitar. The Doobie Brothers will be takin’ it to the streets of Brisbane, playing their own intimate one-off show at The Tivoli on Sunday 16th April.